Jeff Messer picked up hand cycling after an ATV accident left him paralyzed from the waist down. Messer soon became competitive at his new sport participating in many races and rides within his first year! Just over two years ago, Rutland’s Jeff Messer broke his back in an ATV accident, leaving him paralyzed from the waist down. Soon afterward, he discovered Vermont Adaptive Ski & Sports and turned his life-altering injury into a new adventure of recreation through adaptive sports. Messer explored his options for year-round recreation throughout Vermont. He became hooked on hand cycling when he tried it during rehabilitation and eventually went on to complete the 2014 Vermont City Marathon in Burlington, with only a few weeks of training. That same year, Messer became involved in the Long Trail Century Ride to benefit Vermont Adaptive, an annual summer event founded by Phil and Joy Black, owners of the Lookout Tavern in Killington. 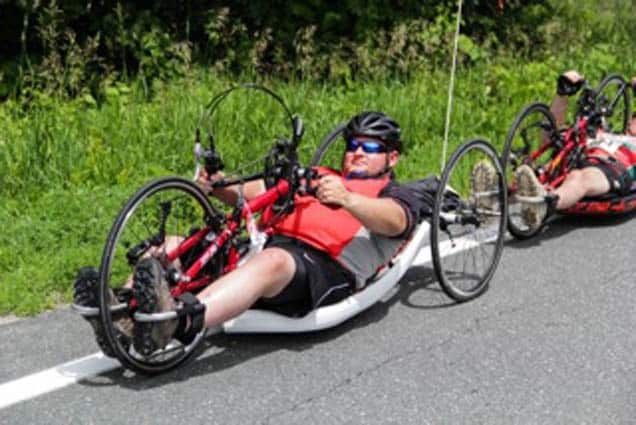 The 100-mile bike ride, with 60- and 20-mile routes, is sponsored by Long Trail Brewing, Killington Resort, the Lookout Tavern and others, and is Vermont Adaptive’s largest annual fundraiser, raising more than $200,000 this summer for adaptive sports programming and equipment. Just two years since his injury, Jeff Messer has already earned the achievement of riding in the Long Trail Century Ride two years in a row. Despite his accident, Messer still enjoys riding an ATV in a side-by-side, and his favorite trails run through areas in Bridgewater, Stockbridge and Ira. He also loves boating on Lake Bomoseen and fishing. When he isn’t hand cycling, out on the lake, or on the ATV trails, Messer tries to learn new adaptive sports as much as he can. He recently tried Sled (Sledge) Hockey for the first time in Burlington, which is an adaptation of ice hockey where players sit in specially designed sleds. Messer hopes to pass on his love of the outdoors to others with disabilities by volunteering with Vermont Adaptive this winter and next summer. He strives to inspire other athletes not to become defeated or set back, but to push the limits every day and become empowered through adaptive sports. Vermont Adaptive offers a variety of sports and activities statewide for participants to continue their recreational pursuits or learn new ones. Southern Vermont adaptive sports programming and outings include cycling along the Castleton-to-Poultney Rail Trail, therapeutic horseback riding at MoonRise Farm in Taftsville, and canoeing and kayaking at the Chittenden and Woodward Reservoirs. Other day trips can be arranged to similar locations, including Silver Lake in Barnard, Suicide Six in Pomfret, the rail trail in Lebanon, N.H., and elsewhere in southern Vermont. Vermont Adaptive also offers group outings by request in several different locations that involve activities like beeper baseball, hiking, rock climbing and tennis. These activities are a chance for people of all abilities to be able to enjoy the Vermont outdoors and to join in on opportunities that many people take for granted. Regardless of ability to pay, Vermont Adaptive empowers its participants to overcome personal challenges by encouraging a healthy lifestyle. For more information on summer programs in southern Vermont, contact Tom Alcorn at south@vermontadaptive.org or visit www.vermontadaptive.org.